Seychelles’ remote Aldabra atoll is free of an invasive alien plant species 40 years after eradication efforts started on four islands in the atoll group. Sisal or agave sisalana as it is known scientifically is a woody herb with a rosette of thick fleshy spiny leaves that are shaped like a sword, measuring up to two metres long. The leaf edges of the plant are spiny with a sharp, dark brown tip. This species of plant spreads quickly and can create impenetrable stands, creating an environment where other plants cannot grow. The plant out-competed native plants of the atoll — a World UNESCO heritage site — decreasing the available habitat and biodiversity as well as food sources for the wildlife. Aldabra, one of the most distant islands of the Seychelles archipelago in the western Indian Ocean, is home to the endemic giant tortoise, the frigate birds, tropic birds and the red-footed booby among other species. Sisal was known to occur at four sites on Aldabra – Picard, Anse Polymnie, Anse Malabar and Ile Michel. 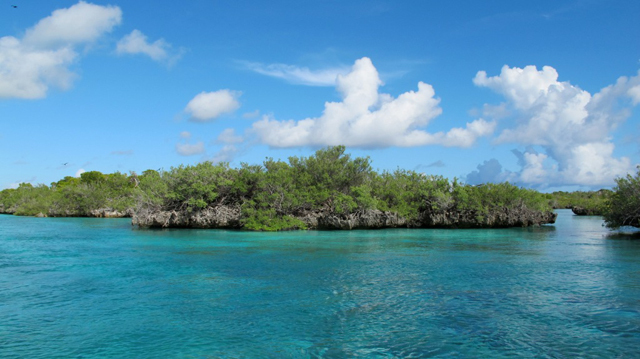 Efforts to remove it from Aldabra started in the 1970s but it was only partially successful as the hard-porous limestone of Aldabra allows the plants to root deeply. As a result, the plant could not be completely removed with manual methods, resulting in continuous control efforts. To determine the most effective and least destructive control method, a team from the foundation started an experimental trial that was carried out over seven months between 2013 and 2014. “Chemical control had not previously been considered because of the risk of herbicide to the environment. Care was taken to ensure that the application methods trialled were individual plant specific. There was no general spraying of any plants other than sisal and care was taken to prevent herbicide from coming into contact with other plant species or the soil,” said SIF. Through the trials, it was ruled that applying a high herbicide concentration directly to the growing tip of the plant killed adult plants. It was also noted that this form of chemical control had no negative effects on the surrounding native vegetation. Originating from Mexico, the plant is believed to have been introduced on the atoll by early settlers for its tough hemp-like fibres and has since spread onto several locations on the atoll. The eradication of Sisal is yet another successful eradication of an invasive species on the atoll in the last seven years. This includes the eradication of feral goats, black rats, feral cats, Madagascar fodies and other alien plant species.